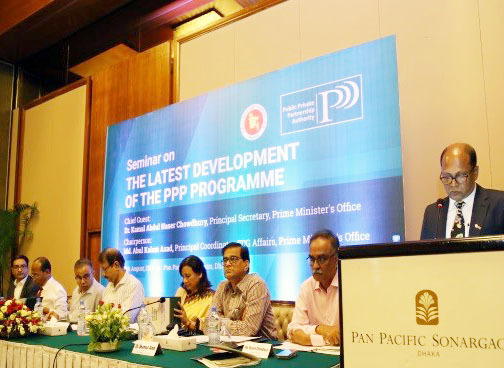 PPP Authority organized a seminar at Pan Pacific Sonargaon, Dhaka on 9 August 2017. The key objective of the seminar was to provide an update to the Secretaries and head of agencies of the Government of Bangladesh regarding the latest development of PPP programme. Respected Principal Secretary of the Prime Minister’s Office Dr. Kamal Abdul Naser Chowdhury graced the occasion as the Chief Guest while the Principal Co-ordinator, SDG Affairs, Md. Abul Kalam Azad was the Chairperson of the event. More than 50 secretaries and agency heads from different ministries, line ministries, agencies, divisions, departments and entities of the government were present in this seminar. It was the first ever congregation of secretaries organised by the PPP Authority. At the outset of the event, Mr. Md. Faruque Ahmed, Director General, PPP Authority welcomed the audience. Dr. Shamsul Alam, Member, General Economics Division provided a presentation describing the context of PPP in the 7th Five Year Plan. Mr. Md. 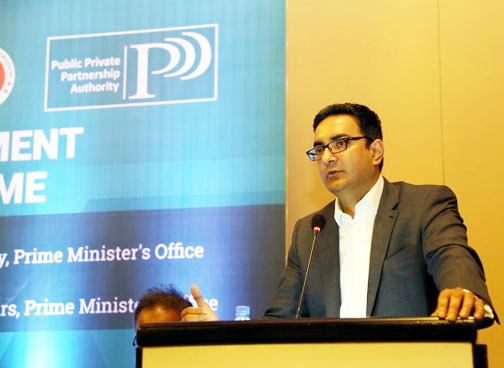 Muslim Chowdhury, Additional Secretary, Ministry of Finance, explained the difference between PPP procurement and public procurement in his presentation, and mentioned that there are lot of confusions among government officials in this regard. In his presentation, Mr. Syed Afsor H. Uddin, CEO, PPP Authority, explained the development of PPP regulatory framework, the reforms introduced through the framework and the impact of such reforms. He discussed about key characteristics of PPP and provided a few examples of PPP projects in Bangladesh and in overseas countries. Mr. Uddin also discussed about the areas for further developments and possible challenges in achieving the targets, and recommendations to overcome those challenges. The Chairperson commenced the discussion session after the presentations. The discussion session was very productive, the participants raised their queries and shared their views and opinions. Mr. Syed Afsor H. Uddin, CEO, PPP Authority and Mr. Md. Muslim Chowdhury, Additional Secretary, Ministry of Finance. provided clarifications of the queries raised by the participants. Later in the event, Suraiya Begum ndc, Senior Secretary, Prime Minister’s Office, and Kazi M. Aminul Islam, Executive Chairman, BIDA gave their speech. They focused on the importance of implementing projects through PPP modality. They emphasized the importance of inclusion of PPP projects in the annual development plans of the ministries. Respected Chief Guest, Principal Secretary of the Prime Minister’s Office Dr. Kamal Abdul Naser Chowdhury, in his speech requested the secretaries to make Bangladesh into a PPP role model in the world, through increasing the number of successful PPP projects by taking up the right projects and effectively addressing the challenges in implementing them. He also suggested to nominate innovative ideas in PPP for Public Administration Award. The event was concluded with the closing address by respected Chairperson of the event, Mr. Md. Abul Kalam Azad, Principal Co-ordinator, SDG Affairs. The Chairperson mentioned that the present government is keen to promote PPP in the country and have commitment in moving forward to deliver more public services through PPP. He applauded the efforts of PPP Authority in arranging this event and appreciated the presence of the guests, who have managed to attend despite of the busy schedule and concluded the event. Workshop on "PPP in Tourism"
Workshop on "Sharing PPP Experiences"